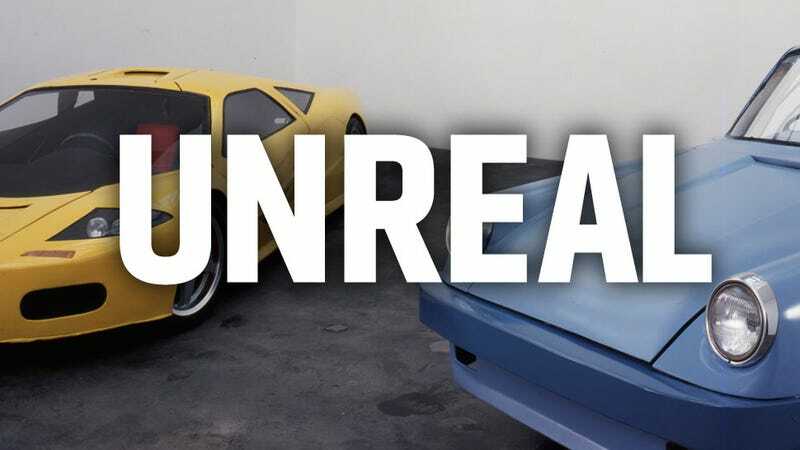 Our recent stories on those shady scam replica-car builders reminded me of something I've been meaning to write about for a long time: an amazing project from artist Tobias Rehberger that's all about making replicas of cars. And not your usual, boring, beautiful, carefully-crafted, hyper-accurate replicas; these replicas are the imperfect products of human memory and flawed communication, and as a result, are fascinating. Rehberger started his project back in 1999, where he contracted a Thai workshop to build him a replica of a Porsche 911, and then the next year, a McLaren F1. What makes these replicas so incredible is that Rehberger only provided the workshop with simple sketches, drawn from memory, of the cars. No dimensions were given beyond that the cars had to be sized so that a normal person could drive them without issue. Everything else was left to the Thai craftsmen. The end results are pretty amazing. The 911 looks, from a distance, basically like the iconic 911 we know, but a much, much rougher, simpler version. There's clearly Beetle headlights and it's likely on a Beetle chassis — which makes sense for the car — but there's a distinct hand-made quality to the rough, unfinished edges and the way things like the front bumper shape has been reduced to a flat, uncurved surface. It's like that original rough sketch and lack of communication made tangible, and I find it wildly appealing. I'd happily daily drive this strangely, sadly endearing sketch of a car. The McLaren (called Yam Koon Chien — all his Thai-built cars have Thai names) is, in some ways, even stranger. Rehberger says that because it's generally less familiar to people, it tends not to be criticized as harshly as the iconic 911. The build quality is a bit more finished, but the more complex overall shape takes on some strange distortions. For example, I don't think the car is even exactly symmetrical. Looking at it is like looking at a McLaren through a funhouse mirror in the rain, and I bet seeing it in person is positively vertiginous. Rehberger also commissioned a Mercedes SLR McLaren, and sent some design sketches and renderings to his guys in Thailand, and they made a strangely blue-headlight'd copy — my guess is some rendering/illustration had stylized blue lights? — before Benz managed to put out the actual one. He really went all out when he commissioned a Renault Alpine (Tod Man Plaa), and only gave the shop verbal instructions over the phone to build it. No pictures or anything. He's even stirred the disturbing waters of early VW history, having a car built from Hitler's own rough sketch of what he thought his "people's car" should look like. The result is similar to VW prototypes that were actually built, but still different enough to clearly be not quite the car that evolved into the Beetle. Our brains sort of translate rough sketches into finished objects subconsciously all the time — that's why we can easily picture what a car would look like based on a sketch in the first place — and what the artist is doing here is making those barely-realized thoughts into actual, metal, working cars. I still think the really interesting comparison is between what Rehberger is doing and what those pants-moisteners over at Super Replicas/fake Top Gear are doing. One group is promising hyper-accurate reproductions, taking your money and producing nothing. The other is promising absolutely nothing, and taking whatever chance and half-imagined interpretations give him, but in the end actually producing real items. They're like two ends of the spectrum of what the strange idea of a replicar is at all: Super Replicas is this impossible ideal, that no rational person thinks is achievable, and Rehberger is the total lack of ideal, that no rational person thinks is the real thing. Maybe I'm overthinking it, but an exhibit of both Rehberger's cars and unfulfilled order sheets from Super Replicas would be amazing.